Having re-read my last couple of posts I realise that I have been guilty of becomming a little misty eyed about the patch and this has come out in my writing. I was brought back down to earth with a bump by a reader, who having read them asked "Who do you think you are? Wordsworth?" They were kidding, but it reminded me that the birds are the stars of this show. I decided to head out to add a few stars to the list. I managed to add three on a spin about the northern end of the patch. On a zoom along the embankment of the north Wirral coast on a rising tide I got great views of plenty of waders. Big numbers of Lapwing, Oystercatcher and Bar-tailed Godwit on the sandbanks. Closer in are dribbles of smaller shorebirds. Turnstone and Dunlin mingled with the odd Ringed Plover. In the channel Redshank are stalking the shallow water, one picking out a tiny crab. With the bright sunshine and the reflected light from the water the Redshank's bellies look really white, but one looks lighter than the rest. 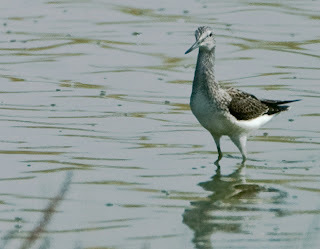 A closer look reveals 2011's first Greenshank and number 80 for the list! Next up was a trip to the pond in Ashton Park. Not top of the list on quality sites on the patch, but I was sure I'd get one for the list here. I was proved right when a flotilla of 4 Tufted Ducks appeared from behind the island. 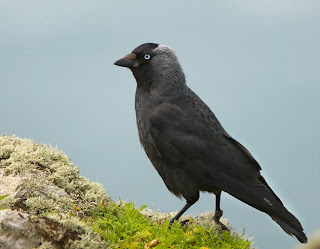 3 males and a female became number 81 on the list. I couldn't help smiling at number 82. I mentioned in a previous post about celebrating the common stuff by keeping a yearlist using number 82 as an example. So as I walked along the Wirral Way and heard several "kjyack"-ing away I rememberd to practice what I've preached and made the effort to get a view of them. 3 Jackdaws flapped over and I watched them for ages until they settled into the Wood Pigeon tree between the Shelter and Exhibition Fields. So 82 is the patch total and I fancy a trip out tomorrow for some more!